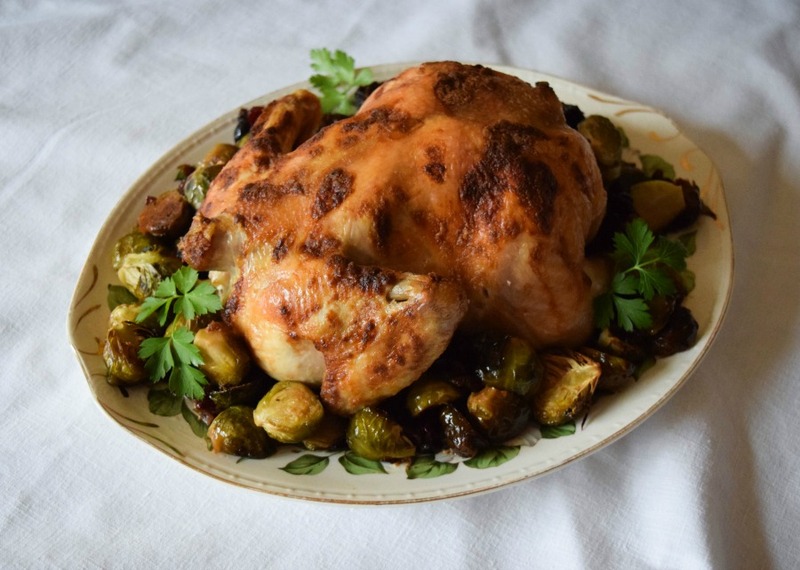 The perfect roast chicken can be an intimidating feat. Getting the skin nicely browned and crisp, cooking the dark meat fully while keeping the breast juicy can seem like a nearly impossible task. But, it doesn’t have to be. With a few tricks of the trade, my Mustard Roasted Chicken never fails to impress. Simple caramelized Brussels sprouts with cranberries is an elegant side that might look like a lot of effort but couldn’t be more straightforward. My favorite part of this dish is that everything goes in the oven in one pan and it all comes out at the same time. Use your Farmer Owned ingredients to whip up this beautiful dinner to wow your guests. They’ll never know how easy it was to make! 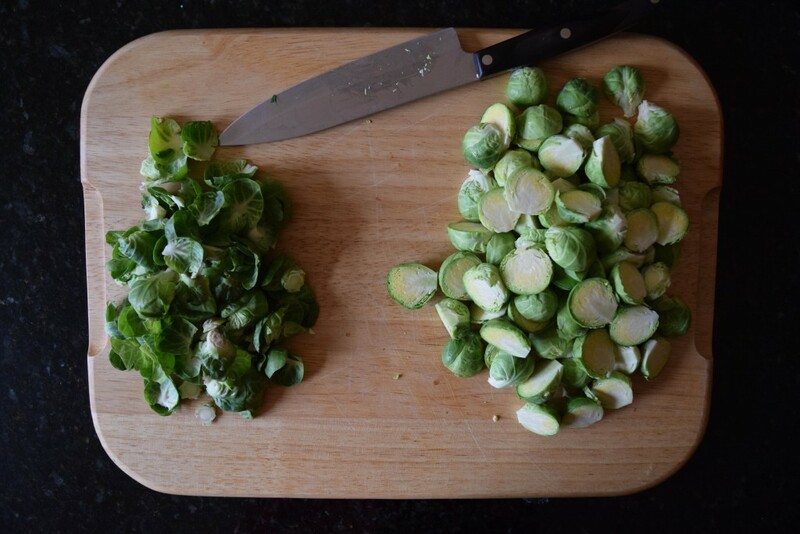 To prepare the Brussels sprouts, rinse and pat dry, trim the bottoms, remove the outermost layer of leaves and cut in half. 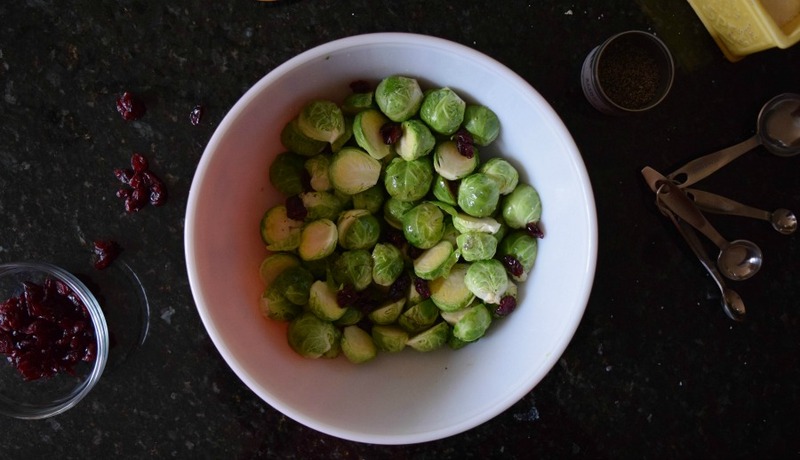 Place the Brussels sprouts in a large bowl, toss with canola oil, salt, pepper and cranberries. Transfer the sprouts to a 9 x 13 inch baking dish. Preheat your oven to 425° F.
To prepare the chicken, pat dry with paper towels. Season the inside and outside with additional salt and pepper. Mix together the soft butter and the mustard. Slather the outside of the chicken with the mustard-butter. Fill the cavity of the chicken with the rosemary sprigs and the lemon quarters. 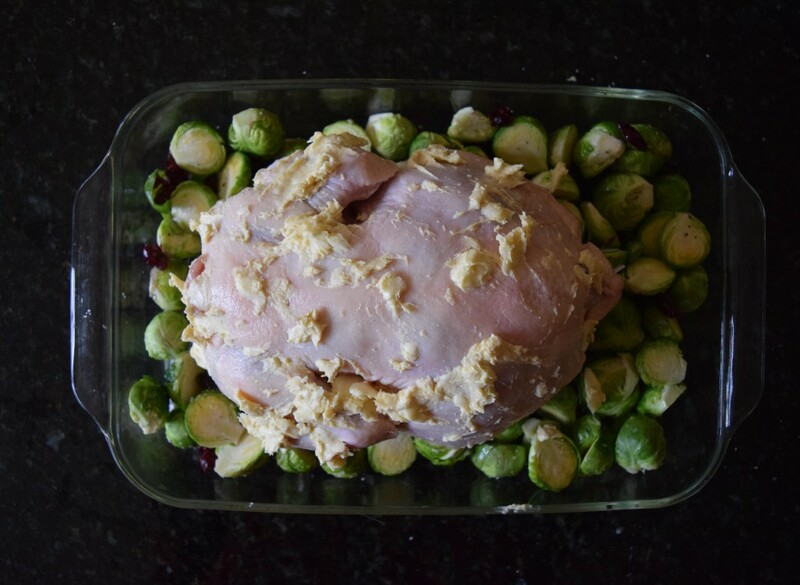 Place the chicken, breast side down, on top of the Brussels sprouts. By roasting the chicken with the breasts down, you ensure they will not overcook while the dark meat finishes. 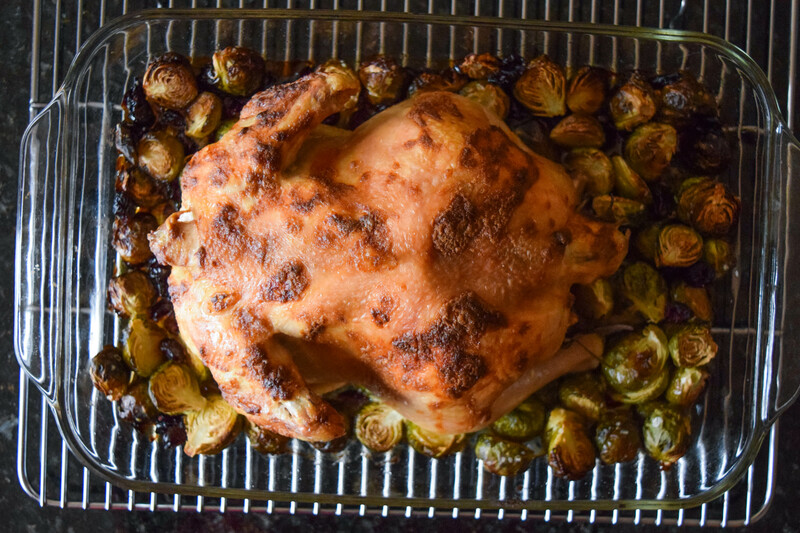 Roast the chicken at 425°F for 25 – 30 minutes until nicely browned. Toss the Brussels sprouts occasionally. Turn the oven down to 350°F and cook for another 20 – 30 minutes until a thermometer inserted near the leg of the chicken reads 160°. Pull the chicken from the oven and let rest for 15 minutes. The temperature will rise another five degrees as the chicken sits. The Brussels sprouts will be caramelized and crunchy. 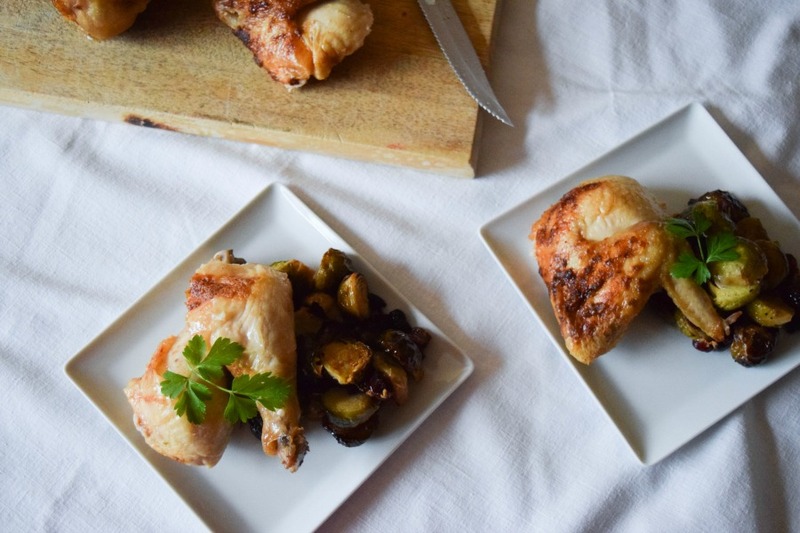 After 15 minutes, transfer the chicken and Brussels sprouts to a serving platter or carve and serve individual portions. Garnish with a few parsley leaves for an elegant finish! I just love your recipes!! They are so easy to make and all of the ingredients can be found in the grocery store. Thank you for sharing them with all of the cooks out there.